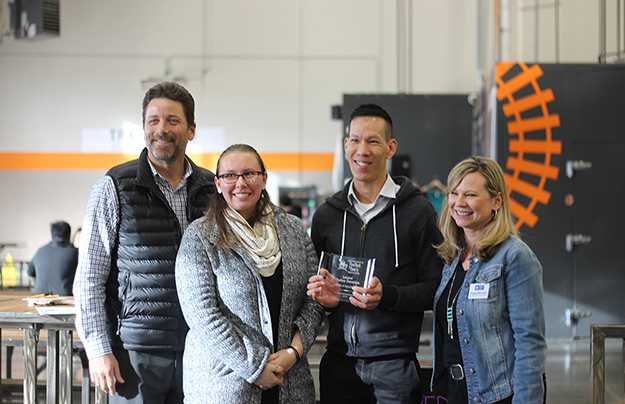 Employees from the Sacramento Food Bank and Family Services present employees from the State Board of Equalization with the award for largest total poundage last night at the State Employees Food Drive wrap party. Totals are now in for the California State Employees Food Drive, which set the ambitious goal to raise 750,000 pounds of food for the 2016/17 food drive, knowing that employees are eager to help Californians in need during the holidays. 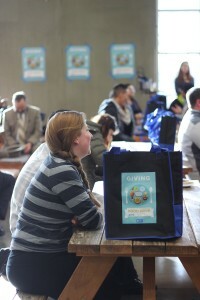 Using the theme, Giving is in Season Year-Round, the drive kicked off in late September to help increase contributions and spanned until early February. The Office of Farm to Fork coordinated the food drive from late September to early February, along with their partners at the Sacramento Food Bank and Family Services and 94 different agencies statewide. Across the state over 764,000 pounds of food were donated, surpassing this year’s goal of 750,000 pounds and clearly demonstrating employees desire to give back to their communities. Outside of the Sacramento area over 100,000 pounds of food were donated to local food banks and pantries, eventually ending up on the tables of Californians throughout the state. The need in California is substantial. According to the California Association of Food Banks, 5.4 million Californians contend with food insecurity, the occasional or constant lack of access to the food one needs for a healthy, active life. Of these Californians, more than two-million are children. To continue momentum and remind employees of this need throughout the three and a half month drive, events were held periodically across the state, including a kickoff day in late September where employees donated over 450 pounds of fresh produce at the Capitol Mall Farmers Market in Sacramento to benefit the Reverse Food Truck, a project of the American Academy of Pediatrics. The event aimed to take advantage of the great produce items still available during the fall in California. As Thanksgiving rolled around 42,882 pounds of turkey (the equivalent of over 3,000 birds) were donated during the annual Turkey Drive and the Run to Feed the Hungry in Sacramento held on November 24th raised $18,127 in registrations and 10,869 pounds of food. Secretary Karen Ross also hosted two “Coffee with the Secretary” events which gave employees a chance to donate money or food, drink a cup of coffee, and chat with Ross in a relaxed festive environment. Each year the State Employees Food Drive hosts a wrap up party and awards are given to highlight the commitment agencies have taken to make the drive a success. For the 2016/17 drive, the Board of Equalization received the award for the largest overall donation poundage totaling 166,889 pounds. Two new award categories were also added this year for most creative fundraiser and the biggest increase in donations from the previous year. CalEPA took home this first category with their Dream it, Built it, Give it competition, where employees built structures out of food donations. Sacramento/San Joaquin Delta Conservancy took home the award for the largest increase by upping donations from 18 pounds to 912 pounds since the 2015/16 drive. Final weights and totals for the State Employees Food Drive will be posted to the website this week following the drive’s wrap up party. This year’s success is a testament to how hardworking and passionate our California State Employees are to helping those less fortunate in our communities. This entry was posted in CA Farm To Fork website on February 22, 2017 by California Farm to Fork.